Although the use of 1911 pistols dates back to the World War I era, they were thoroughly improved to match the changing times. These pistols are quite solid, and you can rely on them in dire situations. Today’s 1911 come in varying sizes and shapes, but one thing remains: the concept design made by John Browning still holds true for 1911 pistol manufacturers. In this article, we will discuss some important points about 1911, and we will also guide you to choose your best 1911 pistol! The production of 1911 for many decades has cemented the reputation of some of the gun manufacturers when it comes to quality and reliability. The guns that will be featured in this article are the best 1911 pistols in their league and worth to be checked out. 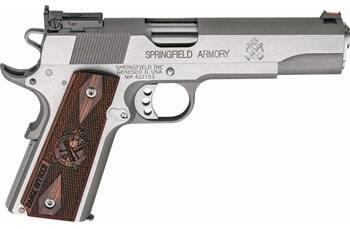 Springfield is a reputable brand known for their well-made 1911s. Quality is one of their priorities, and it shows how well the parts fit into the critical areas. Their popular 1911 pistols are the Loaded, Champion, and the Range Officer. For this article, we will focus on their most famous 1911 pistol, the Range Officer (.45ACP or 9mm). The 40-ounce Range Officer is perfect for free range shooting as evident from its name. It is a well suited for new shooters who want to explore the 1911’s wonders. It’s a beginner-friendly gun because it’s priced less than $1000. Let’s start with the external appearance. This gun’s barrel measured 5 inches and made of match-grade steel. The gun has a durable construction because of the forged steel frame. The finishing can either be blued or Parkerized. As for its front sight, the Range Officer incorporates steel dovetail. Its rear sight is adjustable and made out of the same material. Additionally, the Range Officer utilizes a cocobolo wood grip with the embossed Springfield Armory logo. To detail about the grip further, it has an ergonomic feel and fits a broad range of hand sizes. The wood grip has diamond checkered panel design to add an aesthetic appeal. The overall width of the grip measures 1.25 inches and feels natural to the hand. If you still don’t like the grip design, you can just replace it with another. This single action semi-automatic pistol has a 7+1 magazine capacity if you buy the .45 ACP version. The 9mm caliber version of the same model has a larger capacity at 9+1. The magazines are stainless steel and have witness holes. Its slide is also made of steel. There’s no problem actioning the slide because it can be easily done with your thumb and two fingers. The snugness of the slide to the frame increases the 1911’s accuracy. The trigger of this 1911 pistol is just what you’d expect. The trigger pull is crisp and has short travel. The weight of the trigger pull measures at 5 pounds, and of course, you can adjust it if you want to lower it further. The appearance of the standard trigger is skeletonized with a serrated face. The Range Officer’s accuracy is superb. It can hit targets with less than 1” grouping at 25 yards. It is a competitive pistol and guarantees consistent and precise shots even if you fire more than 100 rounds in one session. The observed recoil is mild and doesn’t affect your performance. We observed no major problems when shooting the Range Officer. However, we spotted some scratches on the cocobolo wood grip, indicating that the material is not as hard as we thought it might be. What’s inside the package when you buy Range Officer? When you buy the gun, you get two extra magazines, a double magazine pouch, a gun lock, a case, a brush, and a holster. Ruger SR1911 is a high-end looking pistol with an average price. 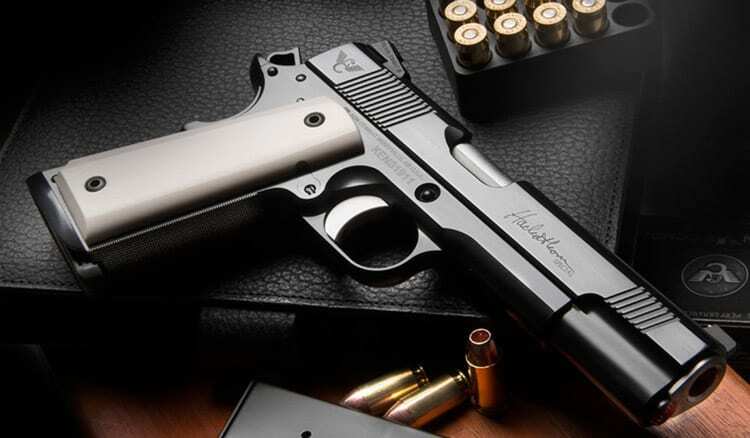 As the company said, their 1911 pistol is a classically designed pistol with modern manufacturing advances. Fair enough, they aren’t lying. This 1911 pistol has a solid construction that is expected to last for a long time despite daily usage. 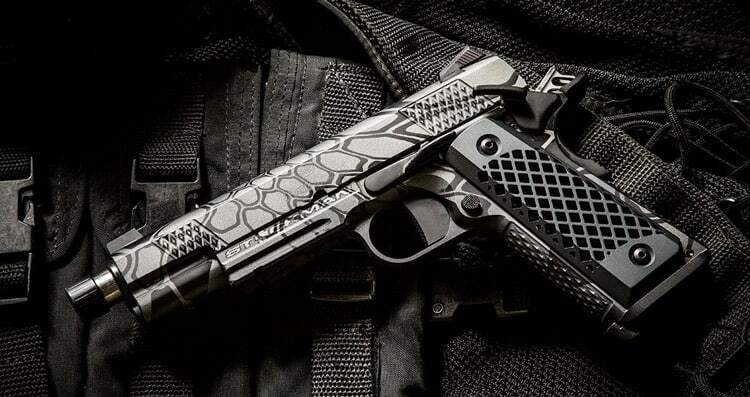 The exterior of the SR1911 is all metal. Despite being all metal, it can be observed that the pistol is 10 ounces lighter than other guns of the same material. Ruger SR1911 has an excellent slide to frame fit and the parts snug perfectly to give a more durable feel. This pistol has a satin stainless finish. All the other small parts of the 1911 pistol such as the slide lock, thumb safety, grip safety, hammer, and the mainspring housing have matte black finishing. This smooth contrast adds to the classic look of the Ruger pistol. As for its grip, it is made out of wood with a double-diamond paneling. It feels comfortable to the hand. Of course, you can replace it if you don’t like the grip design. The trigger pull of Ruger is quite amazing. It is lightweight and made of aluminum. The skeletonized trigger is adjustable for overtravel giving you a more natural pull. We observed that the trigger is very crisp, no creep, and pretty quick. Another great feature of this 1911 pistol is its three-dot sight system for faster target acquisition. They are dovetailed, and the rear is adjustable to suit your liking. Furthermore, the Novak sights are made out of stainless steel. 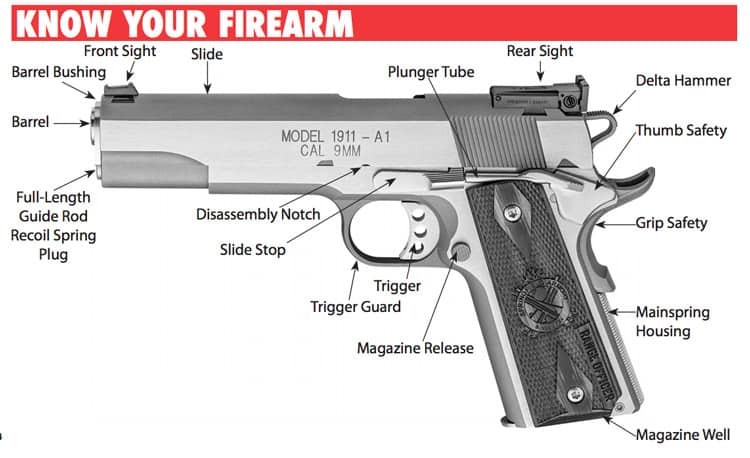 Ruger SR1911 integrates various safety features for your security. One of them is the oversized beavertail grip safety which provides positive function and reliability. Another safety feature is the thumb safety with an extended style. It is only for right-handed use only. Ruger SR1911 has made a significant modification which is the plunger tube for the slide stop and the thumb safety. This means that they are integrated to the frame and won’t loosen no matter how hard you are shooting. As mentioned in the previous paragraph, the thumb safety is not ambidextrous. This can be an advantage or disadvantage to some shooters. We personally don’t like that you can’t switch it off or on with your non-dominant hand. Another thing is the sight. The white dots can be quite difficult to use when you are aiming for accurate shots. The color of the dots could easily be overwhelmed by the surrounding light when you use the gun in a bright surrounding. As for the Ruger’s capacity, the magazine can load 7+1 cartridges into the beveled magazine. Ruger comes with two more stainless steel magazines for extra carry. One of them has a seven-shot capacity with fits flush with the grip frame and an eight-shot magazine with an extended base pad. Its accuracy is remarkable. This 1911 pistol performs well at 25 yards resulting to 2-inch groupings. Smith & Wesson is a gun manufacturer that is known for a long time. They have manufactured millions of gun over the years. Their lineup of 1911 pistols was only introduced in 2003. But even though they are fairly new to manufacturing 1911 pistols, the knowledge they have on them is vast and wide. Their expertise on gun making brings you an SW1911 pistol that you can rely upon for self-defense or recreational shooting. 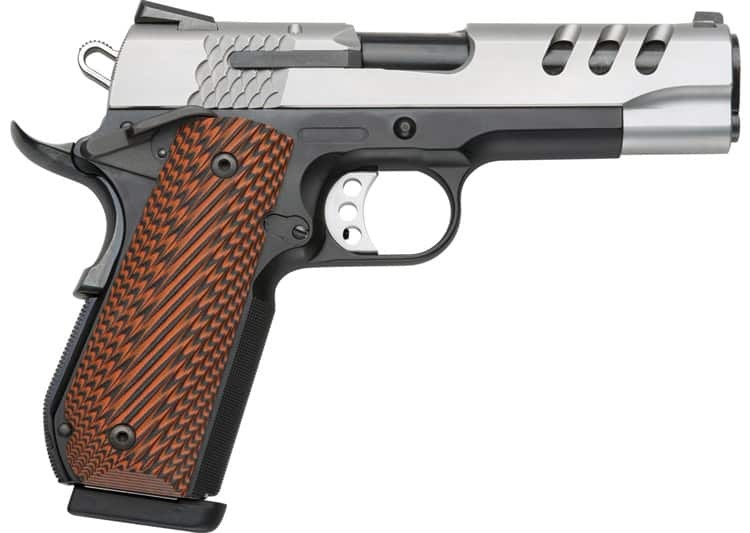 This article will focus on the SW1911 E-Series model. 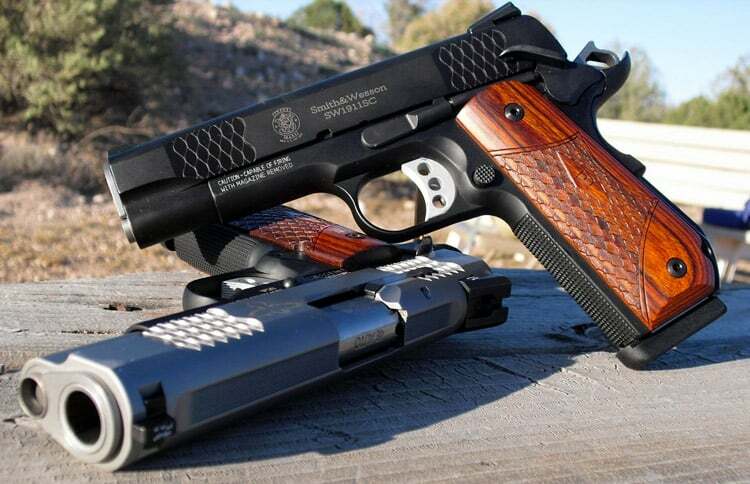 It is an upgraded version of the original SW1911, and it’s understandable that its features are greater than the former. Let’s start off this review with its physical appearance. 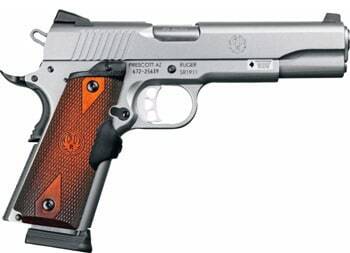 SW1911 E-Series is an all steel pistol that comes in two versions: the .45 ACP and the 9mm. Other external characteristics of this gun are the: 5-inch barrel, tritium night sight for the front and rear, a tactical rail for pistol flashlights or anything else, etc. 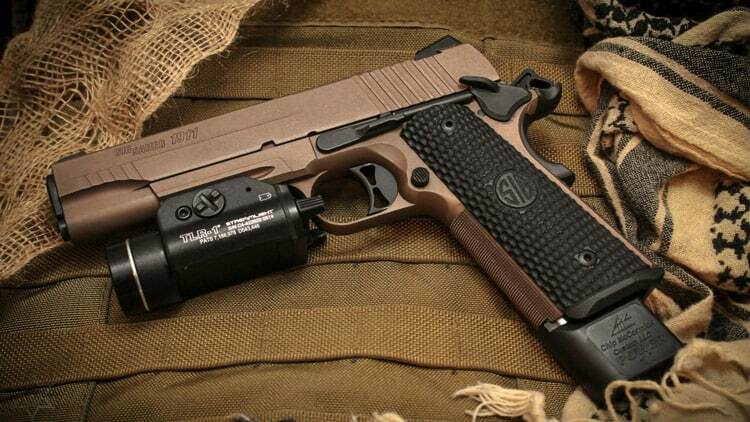 The grip design of SW1911 is attractive. It’s laminated wood and features both scallop and diamond patterns. The letter “E” that stands for “Enhanced” in E-Series is engraved at its center. Indeed, the grip is not just for aesthetics. It feels good to the hand and provides a positive grip when shooting. Its magazine capacity of SW1911 is 8+1 rounds. Two more eight-round magazines come as part of the package. The magazine release button is exposed above the frame level by .145 inch and easy to reach with your thumb. The release button can be operated by both left-handed and right-handed shooters without breaking your normal firing grip. It’s a good thing that the thumb safety is ambidextrous. Two levers are located on both sides of the gun. The left side lever is grooved and measures 1 inch long. On the other side, the right side lever is also the same width, but it’s only .14 inch wide (the left side measure .25 inch). 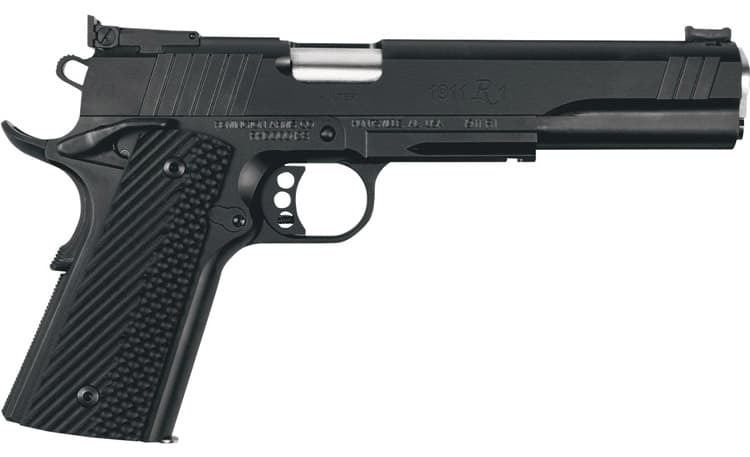 SW1911 E-Series also has a grip safety which uses a memory bump at its base. There are no sharp angles that will inconvenience you later. It’s specially designed for your comfort when shooting. Of course, the main limelight of 1911 is its trigger. Fortunately for Smith & Wesson’s 1911 pistol, they have a precision-fit trigger to help you achieve your desired performance. This gun is already a great weapon. There were no observed drawbacks when we used it for practice shooting. Perhaps its one obvious setback is its high price. Its trigger is crisp, clean, easy break, and smooth. Less force is needed for pulling the trigger, and you can adjust it through its overtravel stop screw according to your liking. SW1911’s accuracy is commendable. At 25 yards, a five-shot group measured 2.5 inches. This data is considered excellent and is deemed to be one of the best 1911 pistols as of date. SIG Sauer is one of those big brands known for their expertise on guns. They use all-American parts to make their heavy pistols but with great triggers. Their 1911 pistols feature all-stainless steel frames and slides. They are machined and hand-fitted to assure you reliability, performance, and accuracy. Various law enforcement and military units around the world use 1911 pistols. SIG Sauer’s Emperor Scorpion is their highest ranking 1911 pistol. XO closely follows it. In this article, we will only review about the Emperor Scorpion. Starting with its physical features, like all other SIG Sauer 1911s, it is also made of stainless steel. We can say that it is apt for use in the battlefield due to its flat dark earth finishing. This coating also makes the Emperor Scorpion easier to clean. Emperor Scorpion features a Hogue Magwell grip set which also functions as mainspring housing. The grip extends past the actual end of the frame for a fitter magazine. This facilitates fast reloading. Likewise, aside from the general positioning of the grips for a more natural hand feel, Emperor Scorpion has 25-lpi checkering found directly at the rear of the pistol. This strikes a right balance between hand-ripping and passive grip. The barrel measures 5 inches and shoots .45 ACP rounds. This 1911 pistol has a magazine capacity of 8+1. Of course, there are two spare magazines available for purchase. The magazines are made of stainless steel. Aside from the excellent grip and thumb safeties, the stock Scorpion trigger is also remarkable. The trigger pull measures 5 pounds and can still be adjusted depending on your liking. It is already great out of the box and consistent to the finger because of its flat layout. The Emperor Scorpion’s accuracy is superb. It can hit the bull’s eye with little efforts. At 25 yards, the shots have an average of 1.5-inch groupings. SIG Sauer Emperor Scorpion is already a great 1911 pistol, but it still has a drawback. This is only minimal and won’t affect the performance of the gun. It’s about the trigger. It has a “catch” or a rough spot before your pull it. A break-in period is necessary before it goes back to normal. Remington is one of the oldest gun manufacturers in American history that is still alive. In fact, they contributed to the WWI by making their first 1911 pistols. After many decades, they released a new 1911 pistol to keep up with the changing times. This is for shooters who want the lowest price but don’t want to sacrifice the 1911’s quality. Remington R1 is the cheapest gun on this list at the price of $700. This gun has a 5-inch barrel made of stainless steel. This steel extends to the slide and frame. The finishing used is the satin black oxide. Its grip set is made of G10 and uses the checkered double diamond pattern. Additionally, this gun features three-dot night sight set into dovetails at the front and back. This 1911 pistol does have some minor quality problems. The grip set is prone to scratching. This is also observed on the gun’s finishing. We believe that Kydex holster may have caused this. Also, the thumb safety is not ambidextrous. It’s for right-handed users only. This could be a disadvantage for those whose dominant hand is their left. The magazine capacity of Remington R1 is 7+1. They also provide two more magazines upon purchase. The magazine is made of stainless steel and is slightly beveled. R1 is into the traditional look as its all of the other parts such as thumb safety, magazine catch, trigger, slide, and grip safety are close replicas of the parts used during WW2. This Remington 1911 pistol has a firing pin safety aside from the usual thumb safety and grip safety. This firing pin safety safeguards the weapon from discharging if you accidentally dropped it on its muzzle. This also results to a grittier trigger pull. R1’s accuracy is remarkable. Standard accuracy testing starts at 25 yards. Depending on the ammunition used, the groupings varied from .75 inch to 3 inches. 1911’s name comes from the year it entered official service. The US Army adopted the pistol as their official side carry on that year and was then known as M1911 (or Model 1911). After many decades, in 1986, 1911 was replaced by Beretta M9 pistol as the official sidearm of the US Military. By this time, more than 2.7 million guns were produced by the American manufacturers. The 1911’s popularity hasn’t decreased since then. A lot of people still use and buy them when they’re available. Modern applications of the pistol include the target shooting and self-defense. 1911 is being used normally for concealed carry because of its size. A well-manufactured 1911 has superior accuracy in close combat. It can also hit the bull’s eye in shooting competitions at 50 yards. It can reach far beyond that depending on the tuning and shooting skills assimilated. Most people would agree that the trigger of 1911 is one of the best. It is considered unique as the trigger slides into the gun’s frame unlike others that hinges on a single point. That’s why the 1911 trigger system is commonly described to be smooth, crisp, light, consistent, etc. 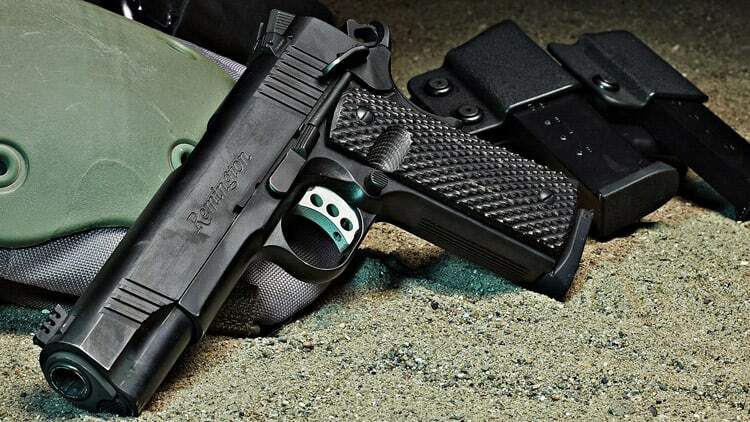 Standard 1911 pistols have a 4-4.5 pound trigger pull, and it can also be tuned down to 2-3 pounds. From the original concept of John Browning, a 1911 pistol has several safety features. Two of them are the grip safety and thumb safety. After many decades, the design was updated, and a new safety feature which was the firing pin block was included. 1911 pistols have single stack magazines loaded with seven to eight cartridges. But it might be considered as a disadvantage because of its low capacity. However, this also turns out to be an advantage for concealed carry use. The 1911 pistols originally had the .45 ACP as the standard caliber. But as decades passed, the modern weapon can now cater a variety of calibers from standard to specialized rounds. Some of them are .40 S&W, 10mm, 9mm, .22LR, etc. It is apparent that longer barrels aid for greater accuracy and balance of the gun. 1911 has specific terminologies for different barrel lengths. The “Long Slide” has a barrel measuring 6 inches or longer. The “Government” has a 5-inch barrel and considered to be the full-size version of 1911. The “Commander” has a 4-inch barrel and considered to be the compact size of 1911. The “Officer” has a 3.5-inch barrel and labeled as subcompact size of 1911. The grip of a standard 1911 handgun is relatively narrow. The small circumference, as well as the long sight radius, make the gun comfortable to shoot and easy to handle. These pistols are usually heavier by a few to several ounces than a polymer-framed gun (like Glock). This is because all of the 1911 pistols use steel as its housing material. Though this is a disadvantage to some, it can benefit those who do target shooting. The weight of the pistol reduces the recoil felt when shooting. A 1911 pistol doesn’t come as cheap as the Glock. Low-end prices of these pistols range from $300-$700. Fully-customized 1911 pistols have their prices range from $1000 to $3000. As mentioned previously, this gun model has seven to eight rounds per magazine. Some may find it a bad deal compared to cheaper guns with more cartridge capacity. The modern 1911 pistols are greater than their predecessors when it comes to accuracy, the technology used, and quality. 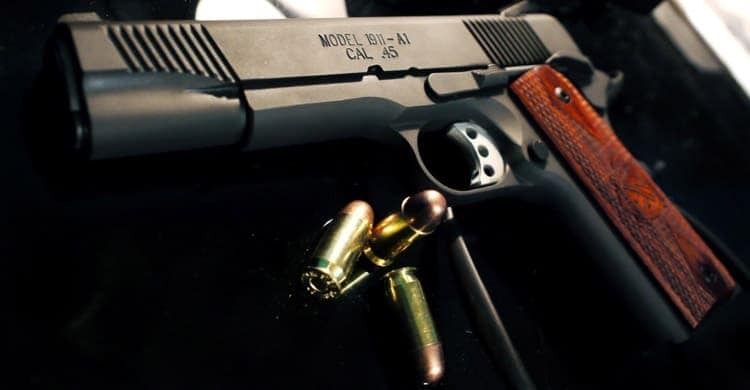 Own a 1911 pistol now, and you will know the difference from other gun models! Don’t buy 9mill weapon the best is 45 acp. 9mill is a pellits ammo. Still the best combat commander high impact to the target big ammo caliber than the 9mil. Have an old auto ordinance 1911 that lots of people scoff at but this particular gun is accurate and reliable after thousands of rounds. Also have a Ruger SR1911 which is truly a Cadillac. Extremely accurate and easy to handle and shoot. Only had it about a year but has become the go to gun for a hunting carry weapon. Accuracy is the biggest plus in dispatching hogs that sometimes get a bit too close. That coupled with it is just flat fun to shoot. Cannot buy a better 1911. Can someone please identify the 1911 last pictured. Thank you. Just the article I was looking for. Thanks for helping me sort the what to buy next question!